Can We Fight And Broker Peace Agreements At The Same Time? There is an ongoing debate over armed United Nations peacekeeping forces and whether their use of force is beneficial or detrimental to building sustainable, positive peace. “Peacekeeping requires a new framework to organize this process. A recent report by a former, and very effective, U.N. force commander, Gen. Carlos Alberto dos Santos Cruz, recommends that U.N. forces not shy away from tactical offensive operations to preempt hostile acts, instead of becoming sitting ducks who lose the respect of the population and actually end up increasing risks for themselves. He is right, and his recommendations complement rather than contradict the conclusions of another recent U.N. report, the so-called HIPPO report, which reaffirmed the primacy of politics in the success of peace operations. The two approaches now need to be combined in a single strategic vision”. 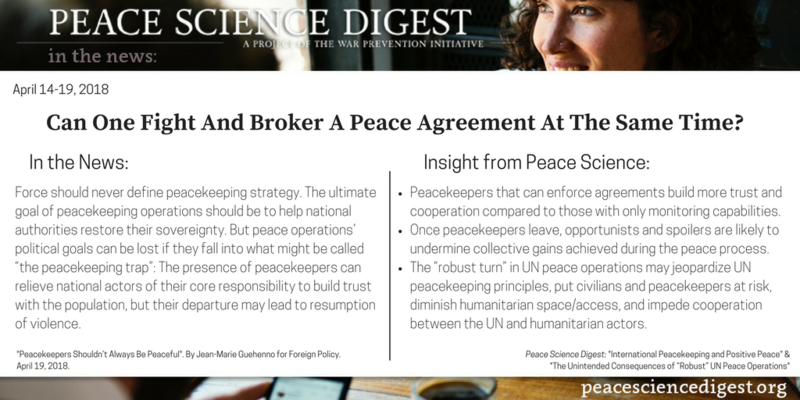 Peacekeepers with the ability to enforce peace agreements are better able to build norms of trust and cooperation compared to the absence of peacekeepers or peacekeepers with only monitoring capabilities. Peacekeeping can enhance pro-social norms by deterring spoilers to the peace process. Once peacekeepers are pulled out of a recovering conflict area, opportunists and spoilers are very likely to undermine collective gains achieved during the peace process. “Peacekeepers Shouldn’t Always Be Peaceful”. By Jean-Marie Guehenno for Foreign Policy. April 19, 2018.